Tea Rex Mug - Moar Stuff - You don't need it but you know you want it. I'd like a spot of tea with my Triceratops steak, please. This Tea Rex Mug (via Amazon) is a funny way to take your tea in the morning. Even if, the the Tea Rex, your arms are a bit short. 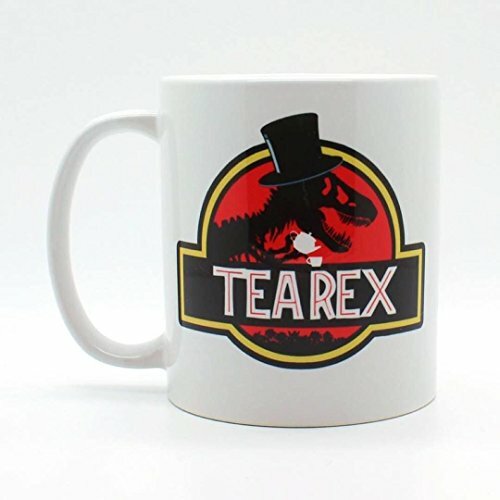 Showing a parody of the classic Jurassic Park logo, this mug improved it by adding a top hat, tea kettle, and tea cup. The design appears on both sides of the mug. The mug is made of kiln-fired porcelain and is both dishwasher and microwave safe. So, assuming no drops, you can expect to be happily drinking your favorite tea from it 65 million years from now. Weight 12.8 ounces (367 g).